What types of credit card processing equipment do you offer? Home» FAQ » What types of credit card processing equipment do you offer? We offer a large variety of credit card processing equipment for your business. This includes Credit Card Terminals, Wireless Credit Card Terminals, IP Terminals, PIN Pads, Check Readers, Contactless Payment, and Credit Card Printers. We carry and offer multiple brands for credit card processing equipment at all price points. Also we offer specific free credit card processing equipment when you set up an account with us including authorize.net, mobile payment gateways, and Link Point payment gateway processing. 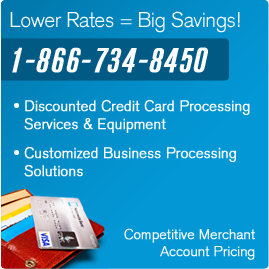 Find out more about our equipment and accounts by calling 866-734-8450 or visit: credit card processing equipment pages.